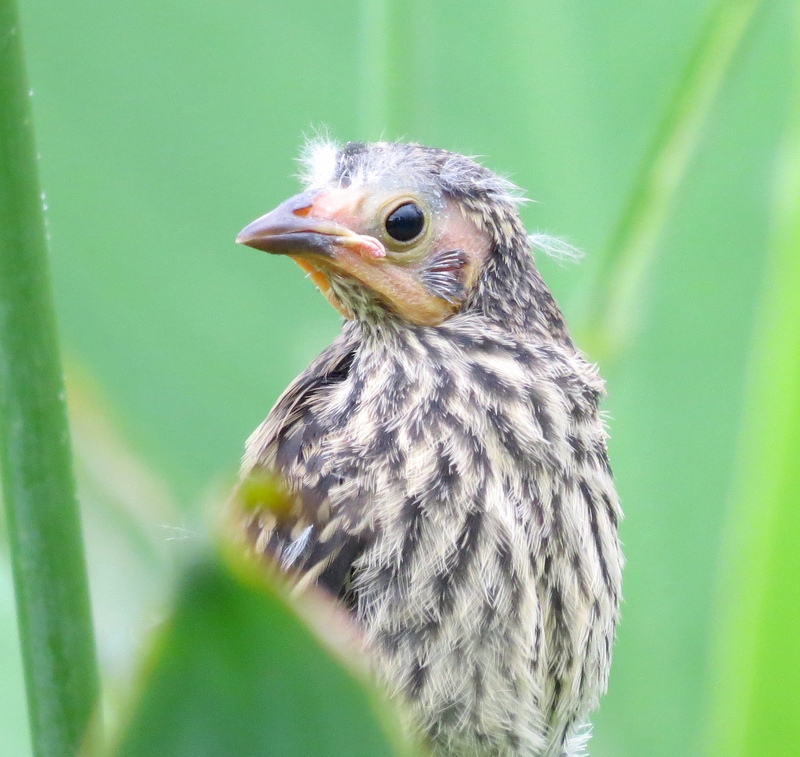 The Red-winged Blackbird nesting season has been in full swing these past few weeks, and LOTS of chicks, like the one above, are beginning to pop their heads up and peek out among the reeds and leaves. 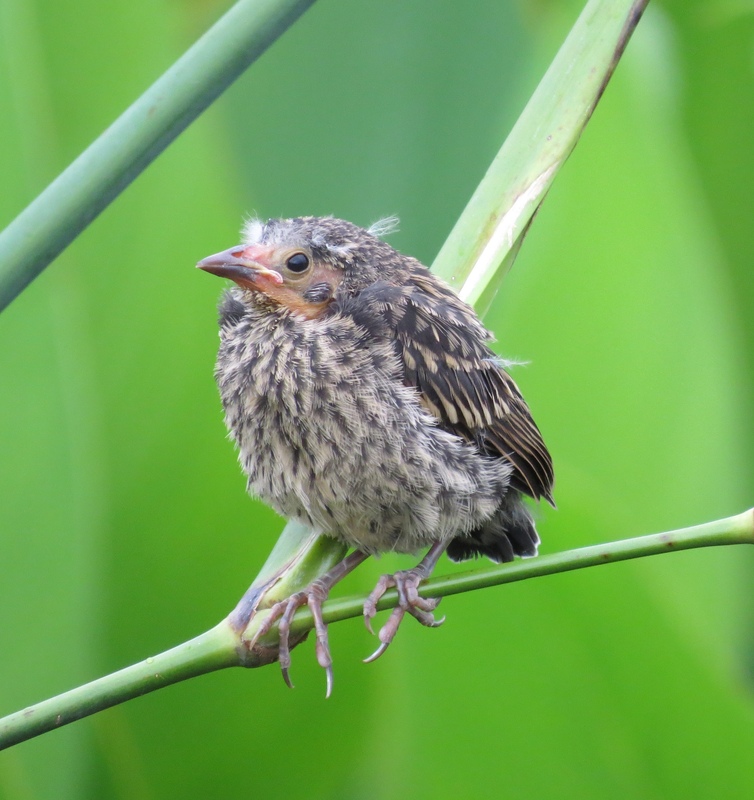 Many baby birds are fledging now, venturing out on their own, away from the nest, on the rocky road to independence, and the RWBB chicks are no exception. These chicks may not look too grown-up yet, but they will soon be ready to move on. When newly hatched, no more than a couple of weeks ago, they were “Blind, naked with scant buffy or grayish down, poorly coordinated” (All About Birds), and quite dependent upon their parents for everything. The male RWBB‘s may have many females in their “harem“, but both parents are very protective and will become quite aggressive if they think their babies are in danger. I can certainly vouch for the point made by Audubon.org that the “Adults are very aggressive in nesting territory, attacking larger birds that approach, and loudly protesting human intruders.” As I walked along the boardwalk just this morning, these vigilant RWBB parents above started flying madly about and screeching at the top of their lungs at both me and a lovely Purple Gallinule! The poor Purple Gallinule was just trying to munch on some of his favorite purple Fireflag blossoms, but he picked the wrong bush – too close to a nest apparently! And I was just trying to take a photo of the Gallinule. I never did actually see the nest or any baby birds that time. The male and the female RWBB‘s kept flying closer and closer to the Gallinule, and at one point, much to my alarm, they literally “dive-bombed” right into him. 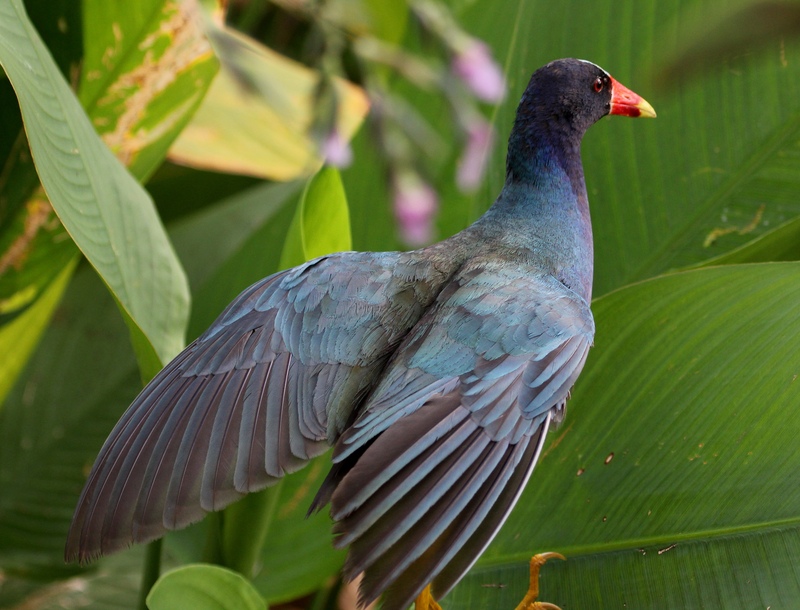 Both the innocent Purple Gallinule and I got the message and left the scene in a hurry! I had seen this female RWBB above a few days ago at a different preserve. She was a bit calmer at first than the mama I encountered this morning, but still very watchful. What worried me was that her chick was really going “out on a limb” – literally, as you can see above – and mama seemed to be getting quite nervous about it. 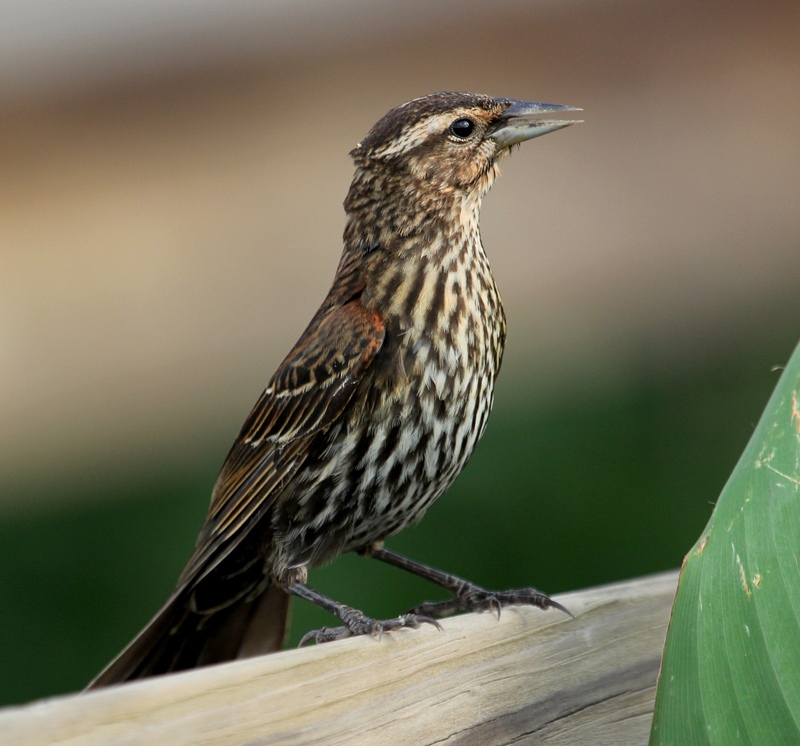 She started to scurry back and forth from stem to stem, flitting down close to the baby bird and then fluttering away again, as the baby inched his way along the leaves and reeds all by himself. The male RWBB appeared to be sending out a loud warning message to all, to stay away. I was beginning to feel as nervous as the mother bird. Her baby’s steps toward independence were looking very precarious out on that thin reed, and I certainly didn’t want to contribute to an accidental fall (! ), so I decided to move on. 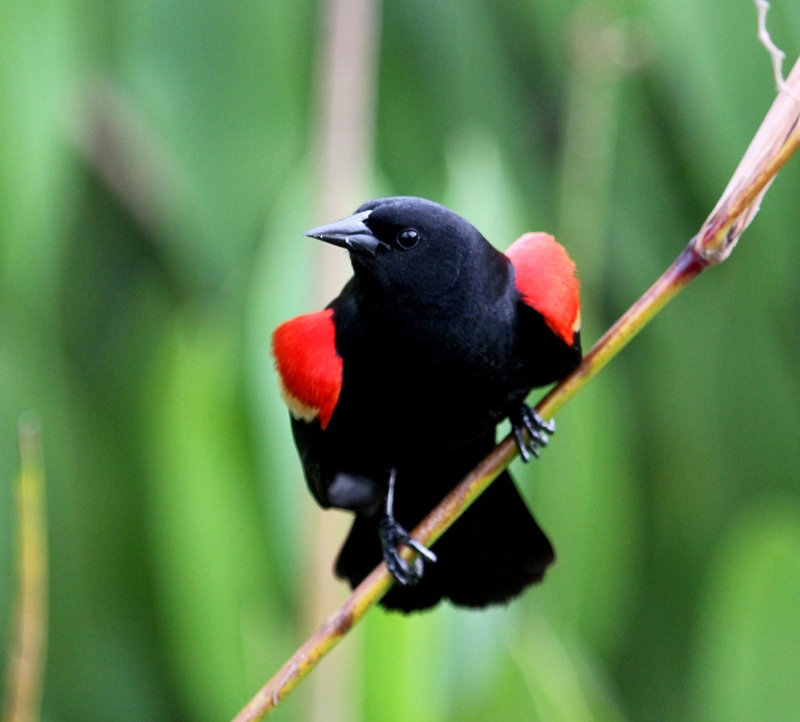 This entry was posted in Birds, Marsh/Wetlands and tagged Purple Gallinule, Red-winged Blackbird. Bookmark the permalink. « How did such a regal-looking bird get such a plain name? Great photographs, especially of the chicks! Thanks – much appreciated M.R.! Beautiful pics, thanks for sharing your new spring arrivals! Thank you, Aussiebirder, for coming along on a visit. I’m glad you enjoyed them, Linda – thank you so much for visiting my blog! So beautiful pictures of lovely birds! Thanks for your kind words, Rockhopper! 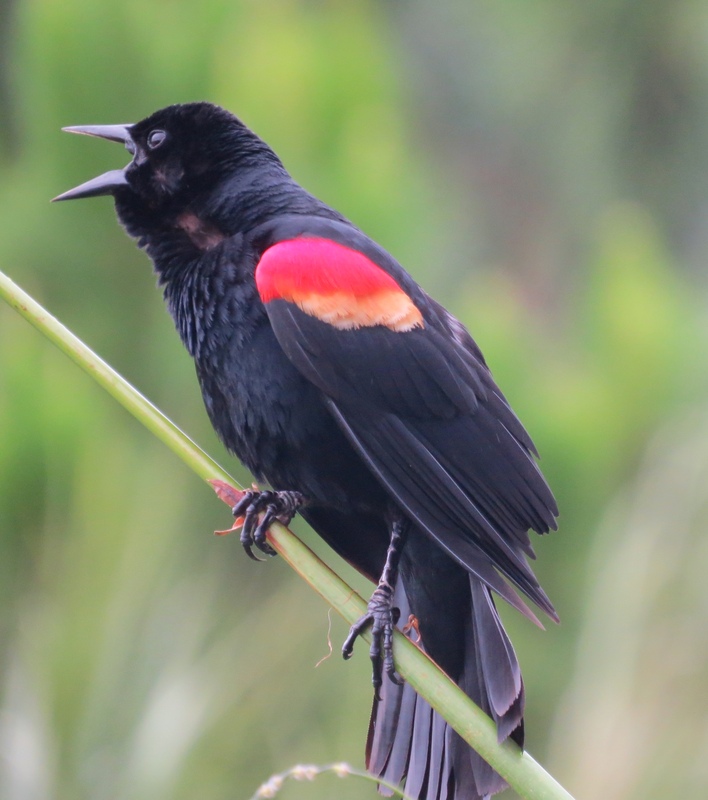 I’m admiring your blog posts, too – what a wonderful variety of birds and wildlife from distant places. That’s a brilliant set, I especially like shot 2 and 6 of the youngster … An excellent set well done. Thank you Marco. 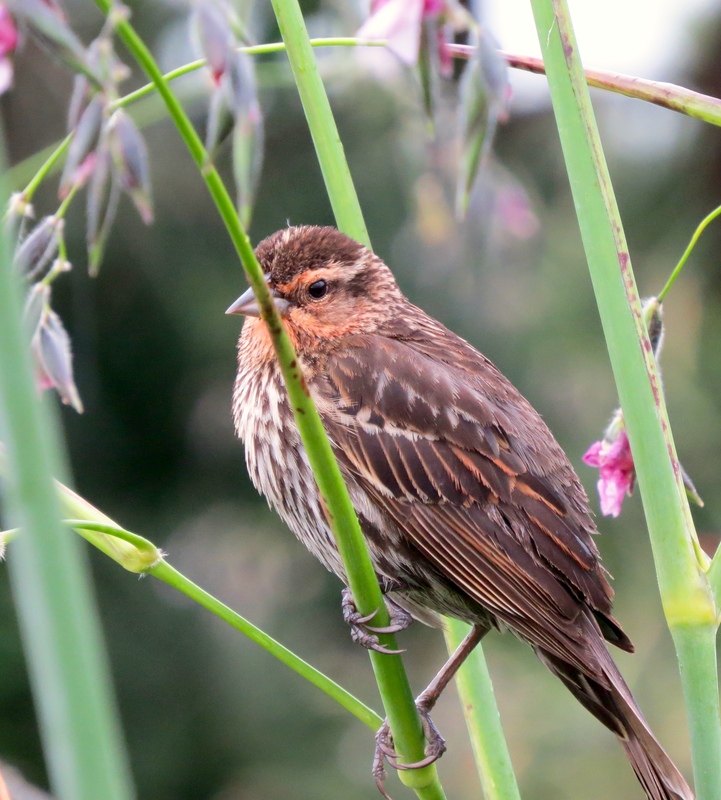 The sight of the baby on that thin little reed showed he had a remarkable sense of balance. Adorable but also potentially perilous 😳. Good story and beautiful photos. I just saw RWBB parents chasing a hawk. They are very bold. I never saw or got a pic of the chicks, so that is a treat for me. Wow, a hawk… Yes, they ARE very bold! Being one who has been attacked by RWBBs while jogging I am highly empathic to your plight. You are a true Woman of Valor. Thanks for your kind words, Chicago Cardinal ;-D!! Do Chicago Cardinals differ from St. Louis Cardinals (or Southeast Florida Cardinals)? I really appreciate your feedback, Phil. Have a great week!